Fiona Bogossian is currently Professor of Practice Education in Health at the University of the Sunshine Coast. Fiona is a Registered Nurse and Midwife with clinical, policy, education and research experience in midwifery and neonatal nursing. She has professional qualifications in education, public health and epidemiology, and a strong track record in teaching and research academic mentorship. Fiona is a Churchill Fellow, a Fellow of the Australian College of Midwives and a Senior Fellow of the Higher Education Academy. As a foundation academic in the UQ School of Nursing & Midwifery (2005-2018), Fiona held leadership roles including Program Director, Director of Research and Director of Research Higher Degrees. 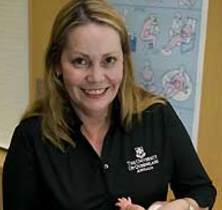 Teaching highlights include implementation of the ground-breaking UQ Bachelor of Nursing curriculum, pioneering the first Bachelor of Midwifery program in Queensland and design and implementation of UQ's first practice based electronic portfolio system. Fiona held strategic responsibility for the School research direction, training and performance contributing to Above World Class Ranking of 5 for the field of research ‘nursing’ in 2012 and 2015. Fiona’s research addresses better perinatal health outcomes and workforce education & development. She has expertise in clinical, health services and education research in particular epidemiology, longitudinal cohort studies, randomised trials, qualitative approaches and mixed methods. She has been Chief and Associate Investigator on $2.9 million of Cat 1 and Cat 4 grants since 2009, and has over 90 peer reviewed publications. Fiona’s disciplinary research and education leadership is demonstrated at local, state, national and international levels through a long history of ministerial appointments, membership of research foundation grants committees, chairing program accreditation panels, as Sub-Editor for Women & Birth, and more recently as a panel member for the ERA Impact and Engagement Pilot (2107), and the discipline representative on the Universitas 21 Health Sciences Group Executive (2013-2016). Vincent-Lambert, Craig and Bogossian, Fiona A guide for the assessment of clinical competence using simulation. Auckland Park, South Africa: Universitas 21 Health Sciences Group - U21 HSG, 2017. Bogossian, Fiona (2017). Instructor resource guides: Chapters 1 - 12. In Understanding research methods for evidence-based practice in health (pp. 1-240) Milton, QLD, Australia: Wiley. McAllister, Lindy, Bogossian, Fiona and Hay, Iain (2012). Learning to write essays and assignments. In Joy Higgs, Rola Ajjawi, Lindy McAllister, Franziska Trede and Stephen Loftus (Ed. ), Communicating in the health sciences 3rd ed. (pp. 67-77) Sydney, Australia: Oxford University Press. Bogossian, Fiona E. (2005). Fiona's birth. In David Vernon (Ed. ), Having a great birth in Australia: Twenty stories of triumph, power, love and delight from the women and men who brought new life into the world and how it was done (pp. 84-90) Canberra, Australia: Australian College of Midwives. Can scholarship in nursing/midwifery education result in a successful research career? Corrigendum to "Undergraduate nursing students' performance in recognising and responding to sudden patient deterioration in high psychological fidelity simulated environments: An Australian multi-centre study"
Introducing the Individual Teamwork Observation Tool (iTOFT): Development and description of a new interprofessional measure. A trial of e-simulation of sudden patient deterioration (FIRST2ACTWEB™) on student learning. Leadership and teamwork in medical emergencies: performance of nursing students and Registered Nurses in simulated patient scenarios. Bogossian, Fiona (2011) A time and a place. Nursing Review, 25-25. Bogossian, Fiona (2005) Storytelling, concept mapping and reflection: A case study of an innovative teaching and learning approach to promote critical thinking about professional issues. Focus on Health Professional Education, 7 1: 91-104. Bogossian, F. (2005) An academic's impressions of the ICM 2005 Congress. Australian Midwifery News, 5 3: 12-13. Bogossian, F. (2003) Reflux, the research and the reality. Special Delivery, 3 . Is a successful research career compatible with scholarship in nursing education? Cooper, S., Seaton, P., Absalom, I., Bogossian, F., Cant, R., Levett-Jones, T., McKenna, L. and Ng, L. (2018). Is a successful research career compatible with scholarship in nursing education?. In: NETNEP 2018, 7th International Nurse Education Conference, “Research, scholarship and evaluation: ensuring nursing leadership in education, practice and healthcare”, Banff Canada, (). 6 - 9 May 2018. Young, Jacqui, Bogossian, Fiona, Brodribb, Wendy and Tin, Anne (2017). A pilot education intervention for General Practice nurses to improve competence and confidence in providing care for mothers and babies. In: State of the Art: APNA National Conference 2017, Hobart , Australia, (). 4-6 May 2017. Ng, L. and Bogossian, F. (2017). Enhancing students’ confidence, competence and knowledge with Integrated Skills Challenge. In: Proceedings of ANSAHPE 2017. Australia and New Zealand Association of Professional Health Educators, Adelaide, SA, Australia, (50-51). 11 - 14 July 2017. Young, Jacqui, Bogossian, Fiona and Brodribb, Wendy (2017). New mothers and baby: FAQ for the first 6 months. In: State of the Art: APNA National Conference 2017, Hobart, Australia, (). 4-6 May 2017. Bogossian, Fiona, Cooper, Simon, Vincent-Lambert, Craig, The Education, Simulation and Safety Collaborative and The U21 Simulation Community of Practice (2017). Simulation Education Smorgasbord. In: Australian College of Neonatal Nurses 25th Annual Conference, Fraser Island, QLD, Australia, (). 18-20 October 2017. Simulation does it really make a difference to practice outcomes? Bogossian, Fiona, Cant, Robyn, Cooper, Simon, Kelly, Michelle, Levett-Jones, Tracy, McKenna, Lisa, Ng, Linda and Seaton, Philippa (2017). Simulation does it really make a difference to practice outcomes?. In: Australian College of Neonatal Nurses 25th Annual Conference, Fraser Island, QLD, Australia, (). 18-20 October 2017. Suffering in silence: the lived experience of Australian midwives facing formal investigation of their practice. The efficacy of newborn early warning tools: an Australian retrospective case-control study. Bogossian, Fiona (2016). 'Little fish - big pond': Strategies to Enhance Your Global Research Profile Invited Masterclass. In: Universitas 21 Health Sciences Group - Doctoral Student Forum, Birmingham, United Kingdom, (). 12-16 September 2016. Bogossian, Fiona and Lambert, Craig (2016). Clinical Simulation Workshop Invited Presentation. In: Universitas 21 Health Sciences Meeting, Birmingham, United Kingdon, (). 12-16 September 2016. Brodribb, Wendy, Bogossian, Fiona, Antovich, Ashley, Young, J., Farley, R., Goodwin, H. and Tin, A. (2016). Sharing the load: a pilot study investigating Practice Nurse involvement in post part consultations. In: Primary Health Care (PHC) Research Conference, Canberra A.C.T., (). 8-9 June 2016. "Good Mother - Bad Mother: Exploring Maternal Ambivalence through the Expereince of Depression and Anxiety During Pregnancy". Staneva A, Bogossian, F, Morawska, A and Wittowski, A (2015). "Good Mother - Bad Mother: Exploring Maternal Ambivalence through the Expereince of Depression and Anxiety During Pregnancy".. In: Motherhood and Culture. International Conference on Motherhood Studies, Maynooth, Ireland, (). 15-18 June. "Obeying the masters: Pregnant women's accounts of obeying and resisting master narratives when expereincing antenatal distress". Staneva, A, Bogossian, F, Morawska, A and Wittowski, A (2015). "Obeying the masters: Pregnant women's accounts of obeying and resisting master narratives when expereincing antenatal distress".. In: Psychology of Women Section, British Psychological Society Annual Conference, Windsor, United Kingdom, (). 8-10 July 2015. "Troubled identity: The experience of depression and anxiety during pregnancy". Staneva, A., Bogossian, F., Morawska, A. and Wittowski, A. (2015). "Troubled identity: The experience of depression and anxiety during pregnancy".. In: Motherhood Matters. Australian Psychological Society, Women and Psychology Interest Group., Preston, Victoria, (). 28 November 2015. Curriculum Challenges in Competency Based Education. Bogossian, F. (2015). Curriculum Challenges in Competency Based Education.. In: U21 Health Sciences Group Annual Meeting. Nursing Discipline Group., Santiago de Chile, Chile, (). 21-25 September 2015. Bogossian, Fiona E. and Cooper, Simon (2015). Invited Paper: Be the assessor: practical experiences for assessing non-technical skills. In: University of Johannesburg Simulation Conference, Doornfontein Campus, Johannesburg, South Africa, (). 13-17 April 2015. Bogossian, Fiona E. and Cooper, Simon (2015). Invited presentation: Be the assessor: practical experiences for assessing technical skills. In: University of Johannesburg Simulation Conference, Doornfontein Campus, Johannesburg, South Africa, (). 13-17 April 2015. Bogossian, Fiona E., Cooper, Simon and DeWaal, Ben (2015). Invited presentation: Debriefing and providing feedback after a simulation. In: University of Johannesburg Simulation Conference, Doornfontein Campus, Johannesburg, South Africa, (). 13-17 April 2015. Bogossian, Fiona E. (2015). Invited presentation: Supervision, publication and citation strategies. In: The School of Nursing, University of Johannesburg, South Africa, Doornfontein Campus, Johannesburg, South Africa, (). 17th April 2015. Bogossian, Fiona and Lambert, Craig (2015). Invited report on the April 2015 Simulation Workshop: a joint University of Johannesburg and University of Queensland project. In: Universitas 21 Health Sciences Meeting, Santiago, Chile, (). 21-25 September 2015. Fahy, Kathleen and Bogossian, Fiona E. (2015). Knowledge and skills for peer reviewing. In: Super Midwives - Making a Difference. The Australian College of Midwives 19th Biennial Conference, Royal Pines Resort, Gold Coast, Australia, (). 5-8 October 2015. Bogossian, Fiona E. and Lyon, Pauline (2015). Selecting the type and design for your simulation. In: University of Johannesburg Simulation Conference, Doornfontein Campus, Johannesburg, South Africa, (). 13-17 April 2015. Simulation: best practices for learning and assessment in research and clinical environments. Invited Workshop. Bogossian, Fiona and Lambert, Craig (2015). Simulation: best practices for learning and assessment in research and clinical environments. Invited Workshop.. In: U21 Health Sciences Group Annual Meeting, Santiago de Chile, Chile, (). 20-25 September 2015. Bogossian, Fiona E. (2015). Speaking the same language: defining simulation terms and concepts. In: University of Johannesburg Simulation Conference, Doornfontein Campus, Johannesburg, South Africa, (). 13-17 April 2015. Surveying the Australian and New Zealand Landscapes: Phase One of a Trans-Tasman program of research for simulation in nursing and midwifery curricula. Bogossian, Fiona E, Cooper, Simon, Levett-Jones, Tracey, McKenna, Lisa, Kelly, Michelle and Seaton, Philippa (2015). Surveying the Australian and New Zealand Landscapes: Phase One of a Trans-Tasman program of research for simulation in nursing and midwifery curricula.. In: Queensland’s Clinical Educations & Training Symposium – Innovate, Create, Participate, Brisbane Australia, (). 12-13 November 2015. Staneva, A. and Bogossian, F. (2014). "Insightful pregnancy": mental health problems during pregnancy and birth consequences. In: 30th Triennial Congress, International Confederation of Midwives, Prague, Czech Republic, (). 1 - 5 June 2014. "So that's what I do, I wear a mask for people, so be it!" The 'untellable' experience of depression, anxiety and stress during pregnancy"
Staneva, A., Bogossian, F., Morawska, A. and Wittowski, A. (2014). "So that's what I do, I wear a mask for people, so be it!" The 'untellable' experience of depression, anxiety and stress during pregnancy". In: The Australian Sociological Association (TASA) Conference, Hobart , TAS, Australia, (). 24-26 November 2014. Miller, Letitia, Mayfield, Sara, Scani, Loretta and Bogossian, Fiona (2014). Hospital acquired pressure injury in paediatric patients with Philadelphia collars. In: UQ Undergraduate Research Conference, Brisbane, Australia, (). 16-17 September 2014. Endacott, R., Cooper, S., Bogossian, F. and The First2Act Team (2014). Managing deteriorating patients: the development and impact of the First2Act training program. In: 5th International Nurse Education Conference, Noordijkerhout, The Netherlands, (). 22-25 June 2014. Bogossian, Fiona (2014). Stress, depression and reflective functioning in mothers of preterm infants. In: 18th Perinatal Society of Australia and New Zealand, Perth, WA, Australia, (). 6-9 April 2014. Heron-Delaney, M., Hughes, R., Pritchard, M., Bogossian, F., Cartwright, D., Brown, E. and Newman, L. (2014). The Relationship between Maternal Stress, Depression and Reflective Functioning in a Preterm Infant Population at 2 years. In: International Conference on Infant Studies, Berlin, Germany, (). 3-5 July 2014. Bogosssian, Fiona and Campbell, Suzanne (2014). To sim or not to sim - that is the question. In: Universitas 21 Health Sciences Meeting, Fudan University Shanghai, China, (). 20-25 September 2014. Can eye-tracking technology improve situational awareness in paramedic clinical education? Ross, L., Williams, B, Cooper, S., O'Meara, P., Bogossian, Fiona E., Browning, M., Sparkes, L. and Black, B. (2013). Can eye-tracking technology improve situational awareness in paramedic clinical education?. In: Paramedics Australasia International Conference 2013, Canberra, ACT, Australia, (). 17-19 October, 2013. Porter, J., First2Act Team and Bogossian, Fiona E. (2013). Development of a web based patient deterioration simulation training program to enhance competence. In: 5th International Clinical Skills Conference, Prato, Italy, (). 19-23 May 2013. Bogossian, Fiona E. and First2Act Team (2013). First2Act: teaching implications for Schools of Nursing and Midwifery. In: CDNM Meeting 2013, Brisbane, QLD, Queensland, (). 11-12 July, 2013. Mayfield, S., Bogossian, F. and Schibler, A. (2013). Health care cost savings using high flow nasal cannula therapy in the paediatric ward. In: 24th Annual Meeting of the European Society for Paediatric Neonatal Intensive Care, Rotterdam, Netherlands, (S68-S69). 12-15 June 2013. Tiwari, Agnes and Bogossian, Fiona E. (2013). Interdisciplinary group meetings: report, group #2. Collaborative healthcare research: barriers, enablers and challenges. In: Dublin 2013: Universitas 21 Health Sciences Group Annual Meeting, Dublin, Ireland, (). 2-6 September, 2013.
Cooper, Simon, Bucknall, Tracey and Bogossian, Fiona E. (2013). Managing deteriorating patients: understanding performance and the impact and development of the FIRST2ACTWeb training program. In: INACSL 2013: 12th Annual International Nursing Simulation/Learning Resource Centers Conference, Las Vegas, NV, USA, (). 12-15 June, 2013.
Cooper, Simon and Bogossian, Fiona E. (2013). Managing patient deterioration: enhancing nurses' competence through face-to-face and web based simulation techniques. In: Simulation on a Budget. 3rd Australian Catholic University (ACU) Simulation in Health Education Showcase (VIC), Melbourne, Victoria, (). 25 November 2013.
Cooper, Simon, First2Act Team and Bogossian, Fiona E. (2013). Showcase and international launch of First2Act Website. In: 11th International Conference for Emergency Nurses (ICEN), Melbourne, Melbourne, (). 9-12 October 2013.
Cooper, Simon, Bogossian, Fiona, Forbes, Helen and First2Act Investigators (2013). Symposium - managing patient deterioration: enhancing nurses’ competence through web-based simulation techniques. In: International Council of Nurses (ICN) 25th Quadrennial Congress, Melbourne, Australia, (). 18-23 May 2013. Porter, J., First2Act Team and Bogossian, Fiona E. (2013). Taking simulation from the live laboratory to an interactive online website. In: Managing the Deteriorating Patient Conference, Melbourne, VIC, Australia, (). 17-18 September 2013.
Who will be the First2Act to recognise and respond to the deteriorating patient? Bogossian, Fiona and First2Act Team (2013). Who will be the First2Act to recognise and respond to the deteriorating patient?. In: International Council of Nurses (ICN) 25th Quadrennial Congress, Melbourne, Australia, (). 18-23 May 2013.
Cooper, Simon and Bogossian, Fiona E. (2013). Workshop. In: Train the Trainer, Brighton, UK, (). 29 October 2013.
Cooper, Simon and Bogossian, Fiona E. (2013). Workshop. In: Train the Trainer, Hong Kong, (). 13 September 2013. Kain, Victoria, Rosenberg, John and Bogossian, Fiona E. (2012). A practical strategy for embedding evidence-based practice into undergraduate nursing and midwifery education. In: National Australian Conference on Evidence-Based Clinical Leadership, Adelaide, Australia, (). 13-14 August 2012. Hovey, D. P., Pritchard, Margo Anne, Davies, M., Cartwright, D. and Bogossian, Fiona E. (2012). Changing nCPAP practice from the NPT to short binasal prongs has positively affected clinical outcomes in very low birth weight infants. In: Collaboration in Perinatal Care. 17th Congress of the Federation of Asian and Oceania Perinatal Societies (FAOPS) & the 16th Annual Congress of the Perinatal Society of Australia and New Zealand (PSANZ), Sydney , NSW, Australia, (). 18-21 March 2012. Saewyc, Elizabeth and Bogossian, Fiona E. (2012). Collaborative Scholarship. In: U21 Health Sciences Group Annual Meeting, Auckland New Zealand, (). 3-7 September 2012. Mayfield, Sara A., Bogossian, Fiona E. and Schibler, Andreas (2012). High flow nasal cannula therapy in a paediatric ward setting. In: Paediatric Intensive Care Mini Conference, Brisbane, Australia, (). November 2012. Mayfield, Sara, Bogossian, Fiona and Schibler, Andreas (2012). High flow nasal cannula therapy in a paediatric ward setting, safety and quality. In: The 37th Australian and New Zealand Annual Scientific Meeting on Intensive Care and the 18th Annual Paediatric and Neonatal Intensive Care Conference, Adelaide Australia, (). 25-27 October 2012. Mayfield, Sara Anne, Schibler, Andreas and Bogossian, Fiona E. (2012). High flow nasal cannula therapy in a paediatric ward setting: safety and quality. In: 3rd Early Career Reseracher Symposium, St Lucia, QLD, Australia, (). 28-30 November 2012. Bogossian, Fiona E. (2012). Managing supervision. In: U21 Health Sciences Group Annual Meeting, Auckland, New Zealand, (). 3-7 September 2012. Bogossian, Fiona E. (2012). Report on nursing doctoral student forum and discussion. In: U21 Health Sciences Group Annual Meeting, Auckland New Zealand, (). 3-7 September 2012. Pritchard, Margo, de Dassal, Therese, Johnston, Linda, Beller, Elaine, Bogossian, Fiona, Callan, Susan, Crothers, Caroline, Hovey, Donna, Russo, Santa and Cartwright, David (2012). Screening developmental domains in pre-term children: Diagnostic validity of "Parents' Evaluation of Developmental Status: Developmental Milestones" (PEDS:DM) Assessment Level. In: 4th Congress of the European Academy of Paediatric Societies EAPS, Istanbul, Turkey, (). 5-9 October 2012. Bogossian, F., Benefer, C., Long and Johnson (2012). The Globesity Epidemic: A Threat to the Future of Maternity Care. In: Breathing New Life into Maternity Care, Melbourne, Australia, (). 24-26 May 2012. Pritchard, M., Cartwright, D., Beller, E., Bogossian, F., Johnston, Li and Glascoe, F. (2012). The effectiveness and effciency of a Parent-Report Assessment Measure in identifying developmental-behavioural diagnosis in children born very pre-term. In: The Society for Developmental and Behavioural Paediatrics Meeting, Phoenix, Arizona, United States, (). 7-10 September 2012. Pritchard, Margo, De Dassel, Therese, Johnston, Linda, Beller, Elaine, Bogossian, Fiona, Callan, Susan, Crothers, Caroline, Hovey, Donna, Russo, Santa, Cartwright, David and Glascoe, Frances (2012). The effectiveness and efficiency of a parent-report assessment measure in identifying developmental-behavioural diagnoses in children born very pre-term. In: 21st Annual RBWH Healthcare Symposium, Brisbane Australia, (). 8-12 October 2012. The great debate - what is the most important organ in the body? Humphreyes-Reid, Lindy and Bogossian, Fiona E. (2012). The great debate - what is the most important organ in the body?. In: UQ Young Scholars Program 2012, St Lucia, QLD, Australia, (). 25-29 November 2012. Lim, Joanne, Ahern, Kathy and Bogossian, Fiona (2012). Workplace innovation: The contribution of personal and cultural variations in nurses' daily stress and coping. In: 2nd International Nursing Research Conference, Kuala Lumpur, Malaysia, (). 9-10 February 2012. Hovey, D. P., Pritchard, M. A., Davies, M., Cartwright, D. and Bogossian, F. (2011). Changing nCPAP practice from the NPT to short binasal prongs has positively affected clinical outcomes in very low birth weight infants. In: 20th RBWH Health Care Symposium, Brisbane, Australia, (). 10-14 October 2011. Pritchard, M. A., deDassal, T., Bogossian, F., Callan, S., Crothers, C., Hovey, D., Cartwright, D., Johnston, L., Russo, S. and Beller, E. (2011). Developmental surveillance in high-risk children: Validation of parental assessment. In: 20th Annual RBWH Health Care Symposium: Personalised Health Care, Brisbane, Australia, (). 10-14 October 2011. Kain, V., Hepworth, J., Bogossian, F. and McTaggart, L. (2011). Integrating research into the undergraduate nursing and midwifery student experience. In: Practical Experiences in Professional Education (PEPE) Conference 2011, Brisbane, Qld, Australia, (). 19 - 21 January 2011. Masterclass Doctoral Student Forum – “It’s not just a PhD…” Invited paper presented at Universitas 21 Health Sciences Group Meeting Seoul, Korea. Bogossian, F. E. (2011). Masterclass Doctoral Student Forum – “It’s not just a PhD…” Invited paper presented at Universitas 21 Health Sciences Group Meeting Seoul, Korea.. In: Doctoral Student Forum Universitas 21Health Sciences Group Meeting, Seoul Korea, (). 26th September 2011. Lim, Joanne and Bogossian, Fiona E. (2011). Nurses’ stress and coping across work/life dimensions in Queensland and Singapore: implications for innovative workplace reform. In: Caring professionals towards excellent healthcare. 1st Regional Health Sciences & Nursing Conference, Selangor, Malaysia, (). 22-24 February 2011. Bogossian, F.E. (2011). Oceania Report. In: Nursing Group Meeting. Universitas 21 Health Sciences Meeting., Seoul Korea, (). 28th September. Bogossian, F.E. (2011). Research Collaboration. In: Nursing Group Meeting. Universitas 21 Health Sciences Meeting., Seoul Korea, (). 29th September 2011. Lim, Joanne, Hepworth, Julie and Fiona Bogossian (2011). Stress, Uplifts and Coping in the Personal and Professional Lives of Singaporean Nurses: Implications for Innovative Workplace Reform. In: 1st NUS-NUH International Nursing Conference, Singapore, (). 17-19 November 2011. How chilly is too chilly? Fox-Young, Stephanie, Bogossian, Fiona E., Varghese, Pauline M., Thompson, A., Watson, M., Neads, P., Forbes, K., Toscano, E., Groves, M., Barclay, D. and Hynes, V. (2010). Seeing, doing, being: Evaluating learning outcomes for participant, observer and actor groups in a scenario based simulation. In: Inaugural Innovate and Educate Conference, Brisbane, Qld, Australia, (). 11-12 March 2010. Bogossian, Fiona, Strand, Haakan, Fox-Young, Stephanie and Long, Phil (2010). The Flip Cam (TM) Pilot: Authenticating clinical assessment using video capture technology. In: Innovate and Educate Conference 2010, Brisbane, QLD, Australia, (). 11-12 March 2010. Beller, E., Bogossian, F., Callan, S., Johnston, L., Pritchard, M. A. and Wiggins, T. (2009). Developmental surveillance in high-risk children: a response to a growing heath and service dilemma. In: Queensland Nursing Council Meeting 2009, Brisbane, Queensland, Australia, (). August, 2009. Bogossian, Fiona E., Fox-Young, Stephanie, Long, Phil and Strand, Haakan (2009). Enhancing the authenticity of assessment in the Master of Nurse Practitioner Studies program through personal video capture technology. In: Abstracts: Blended Learning Conference. Blended Learning Conference, Brisbane, Australia, (). 18 June 2009. Bogossian, Fiona E. (2009). Midwives and doulas working together. In: Midwives Making a Difference. Australian College of Midwives Educational Meeting, Brisbane, QLD, Australia, (). 25 August 2010. Bogossian, F. (2009). Midwives working with women and doulas? Negotiating roles and relationships to achieve safe, satisfying maternity care. In: Midwives & Women: A Brilliant Blend. Australian College of Midwives 16th National Conference. Midwives & Women: A Brilliant Blend, Adelaide, SA, Australia, (). 22 - 25 September 2009. Fox-Young, Stephanie, Bogossian, Fiona E., Varghese, Pauline M., Thompson, Andrea, Watson, M., Neads, P., Forbes, K., Toscano,Elesha, Groves, Michele, Barclay, D. and Hynes, V. (2009). Planting seeds: Fostering undergraduate inter professional practice through scenario based simulation. In: Simulation - Concepts, Capability and Technology. SimTecT 2009, Adelaide, SA, Australia, (). 15-19 June 2009. Brandis, Tracey, Varghese, Pauline M., Toscano, Elesha, Bogossian, Fiona E., Groves, M., Forbes, K., Watson, M., Neads, P., Hynes, V and Fox-Young, Stephanie (2009). Playing doctors and nurses: Interprofessional scenario based simulation. In: A time of change. Nursing Leadership 2009, Melbourne, Vic, Australia, (). 9-10 June 2009. Bogossian, F. (2008). Digging deeper: Uncovering the depth and interactions between maternal fatigue, social support and physical activity at three and six months postpartum. In: International Confederation of Midwives 28th Triennial Congress, Glasgow, UK, (). 1-5 June 2008. Hodby, S. and Bogossian, Fiona E. (2008). Encouraging health professionals smoking cessation interventions to promote normal birth. In: Breathing New Life into Maternity Care, Surfers Paradise, Qld, Australia, (). 19-20 September 2008. Bogossian, F. (2008). The midwifery clinical practice performance electronic portfolio (MCPPeP): A template for enhancing the authenticity of assessment and feedback in midwifery professional development. In: International Confederation of Midwives 28th Triennial Congress, Glasgow, Scotland, (). 1-5 June 2008. Frydenlund, I., Bogossian, Fiona E. and Kellett, Susan (2008). The use of tablet PCs to access electronic portfolios in the clinical setting: A student's perspective. In: Queensland Health Clnical Nurse Leaders Passionate about Practice Conference, Brisbane, Qld, Australia, (). 23-24 June 2008. Bogossian, F. (2007). Implementation of the Bachelor of Midwifery in Queensland. In: Future Directions in Midwifery: a Shared Vision, Brisbane, Qld, Australia, (). 2007. Williams, S., Laurens, N., Bogossian, F. and Davies, E. (2006). Evaluation of a peer mentoring program within an undergraduate problem based learning nursing curriculum in the clinical placement setting: A pilot project. In: Effective Teaching and Learning Conference, Brisbane, Australia, (). 2-3 November 2006. Bogossian, F. and Hawthorne, F. (2006). Providing evidence for nursing practice: The development of a Clinical Practice Performance Portfolio. In: Effective Teaching and Learning Conference 2006, University of Queensland, Brisbane, Qld, Australia, (). 2-3 November, 2006. Bogossian, F. (2005). Lessons from the mother's health study: Clearing the path towards healthier motherhood. In: 27th Triennnial Congress of the International Confederation of Midwives. 27th Triennnial Congress of the International Confederation of Midwives, Brisbane, Qld, Australia, (). 24-27 July2005. Bogossian, Fiona E. (2004). Information on the Queensland Government Maternity Services Review. In: Midwifery Forum, Mater Hospital, Brisbane, Qld, Australia, (). 2004. Bogossian, F. and Ozolins, J. (2003). Ethics and values in professional courses: A dialogue between nursing and philosophy. In: Proceedings of : Internal Forum on Values-based Professional Education. Values-based professional education forum, ACU National North Sydney Campus, (). 2003. Bogossian, Fiona E. (2002). The mother's health study. In: ACU School of Nursing Contemporary Midwifery Research Forum, Brisbane, Qld, Australia, (). 2002. Bogossian, Fiona E. (2001). Nursing education: A university view. In: Director of Nursing Southern Zone Workshop, Brisbane, Qld, Australia, (). 2001. Bogossian, Fiona E. (2001). Promoting research within and across schools: New research management systems. In: ACU Heads of Schools Meeting, Sydney, NSW, Australia, (). 2001. Bogossian, Fiona E. (2001). The role of social support in maternal health. In: Professional Development Series: Maternal Health Issues, Wesley Hospital, Brisbane, Qld, Australia, (). 2001. Bogossian, Fiona E. (2000). Closing address. In: Midwifery on the Move, Brisbane, Qld, Australia, (). 2000. Bogossian, Fiona E. (2000). Postnatal health and social support. In: Passage to Motherhood II Conference, Brisbane, Qld, Australia, (). 6 April 2000. Bogossian, Fiona E. (2000). Postnatal health and social support: Preliminary findings of a randomised controlled trial. In: Helping Families Change Conference, Brisbane, Qld, Australia, (). 17-19 February 2000. Bogossian, Fiona E. (2000). Progress in the mother's health study. In: Professional Development Series: Maternal Health Issues, Mater Hospital, Brisbane, Qld, Australia, (). 2000. Bogossian, Fiona E. (2000). The mother's health study. In: Passage to Motherhood II Conference, Brisbane, Qld, Australia, (). 6 April 2000. Bogossian, Fiona E. (1999). Legal issues in midwifery practice. In: Contemporary Issues in Midwifery Practice, Redcliffe, Qld, Australia, (). 1999. BARROS, WT, BOGOSSIAN, F and LOPES, PCC (1994). STRUCTURAL-GEOLOGICAL CHARACTERIZATION DETERMINES LOW-COST SOLUTION FOR SLOPE STABILIZATION. In: 13th International Conference on Soil Mechanics and Foundation Engineering, New Delhi India, (373-375). Jan 05-10, 1994. Bogossian, F. (2005, June 01). Doctor's apology inadequate. , . Bogossian, Fiona E. (2004). The mothers' health study : a randomised controlled trial of a social support intervention on the health of mothers in the year after birth PhD Thesis, School of Population Health, The University of Queensland.